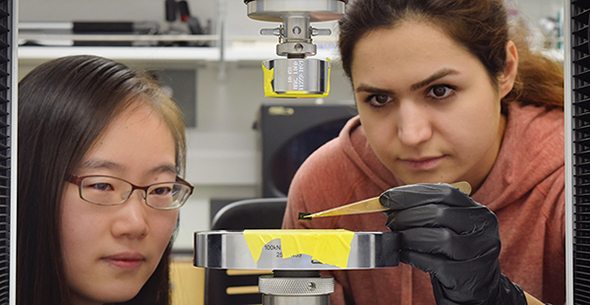 Professor Yue 'Jessica' Wang's lab explores synthesizing organic polymer compounds to create a new wave of electronics. Each team member has his or her own specialty. 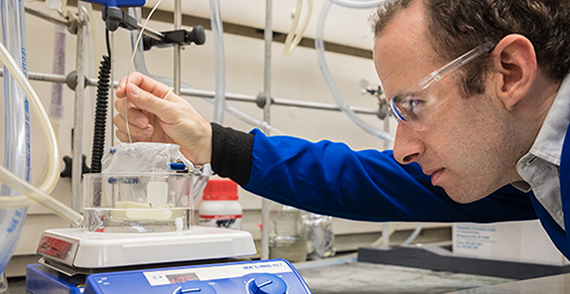 For example, postdoctoral researcher Rob Jordan, who followed Wang to UC Merced from UCLA, designs and synthesizes materials with programmable physical properties. Ian Hill, a third-year grad student from Riverbank, transforms these materials into a form that can be extruded through a 3D printer to create electronic components of shapes that perfectly resemble the 3D topography of human bodies. John Misiaszek, a third-year undergrad from Encinitas, designs and builds instruments the team uses to conduct its research, including 3D printing a custom 3D printer that tailors to the processing needs of materials the team developed.